I am a former aerospace engineer (22 years) and my wife recently retired from the engineering world after 27 years. 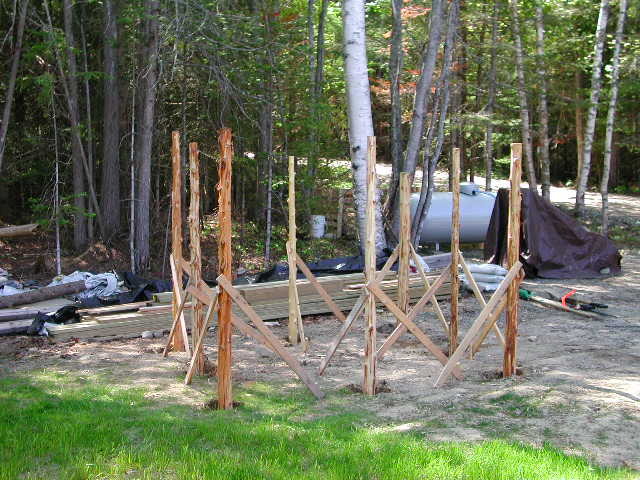 We had started planning a lifestyle change and a move to Maine around 1990. Four years of looking for property resulted in us purchasing this property in 1994. We did not get around to building our home until 2001. I quit my engineering job in the summer of 2001 to be involved in the building of the house and I have not looked back. My wife now has one less job and can concentrate on the bed & breakfast and farming activities. We are both vegetarians trying to raise, grow, and make as much of our food as possible. 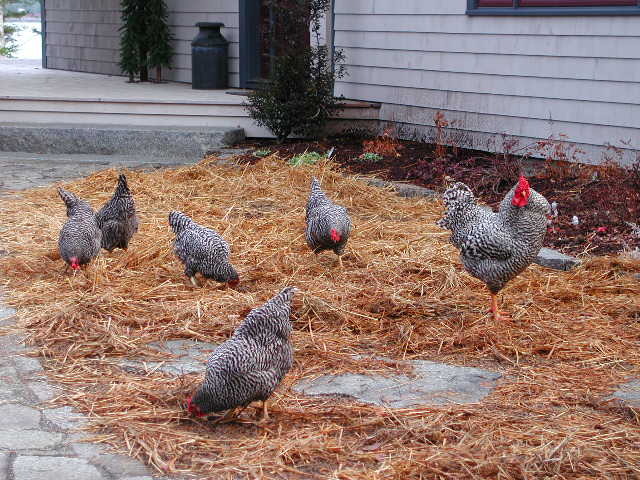 We are raising free range, organic fed chickens for eggs, growing an organic vegetable / berry garden and a fruit orchard. Sheep are raised for wool and to preserve the breeds' genetics. We have pressed apple cider, made maple syrup, yogurt, cheese, pickles, jams, jellies, and soap. We preserve as much of our garden produce as possible. 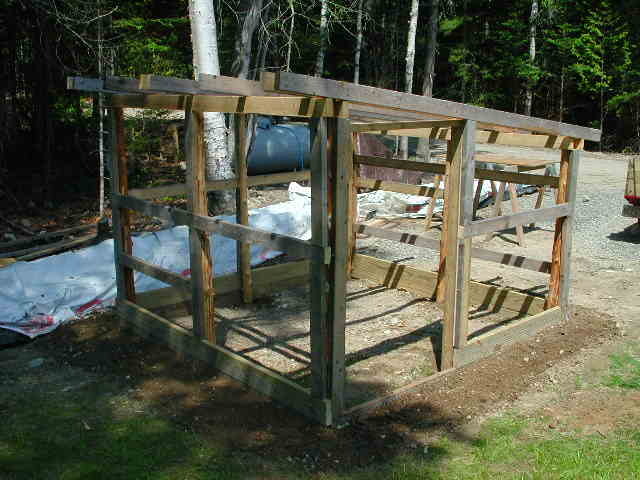 I have built a chicken coop, pole barn, kitchen garden, well house, equipment shed, straw bale ram shelter, and hoop greenhouse. We have four legged farm animals living in the barn which has lights and pumped water powered by solar panels. Several hundred feet of animal fencing has been put up and a couple of acres of woods have been cleared for pasture. My wife started up the bed & breakfast business in the summer of 2003. We had two semi-attached rooms built specifically with this in mind when the house was under construction. Being an innkeeper is her chosen profession when she is up here. Running a home based business is completely new to us but makes sense living in this part of Maine. Below are some of the projects in the first year of our new careers. 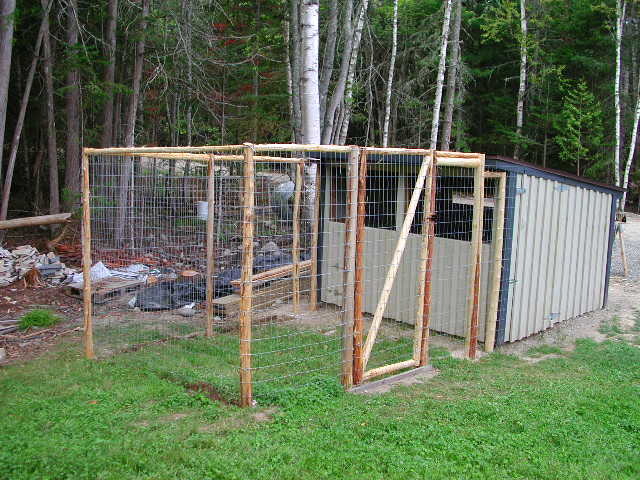 Our chicken coop. 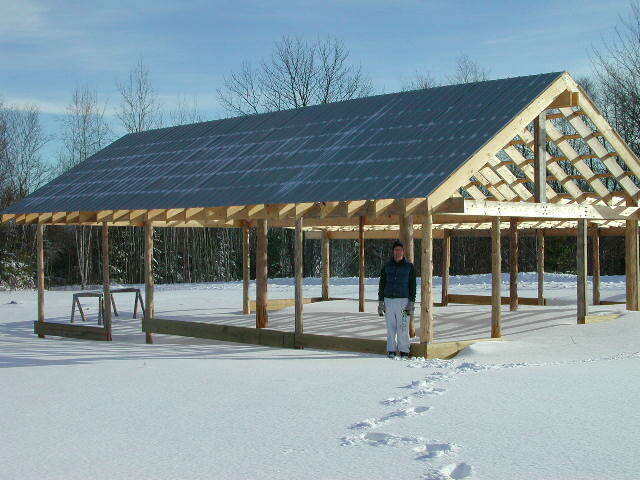 A pole barn on a very small scale. No artificial light and unheated. Several of our Dominique chickens. We now have 17 hens and 1 rooster. 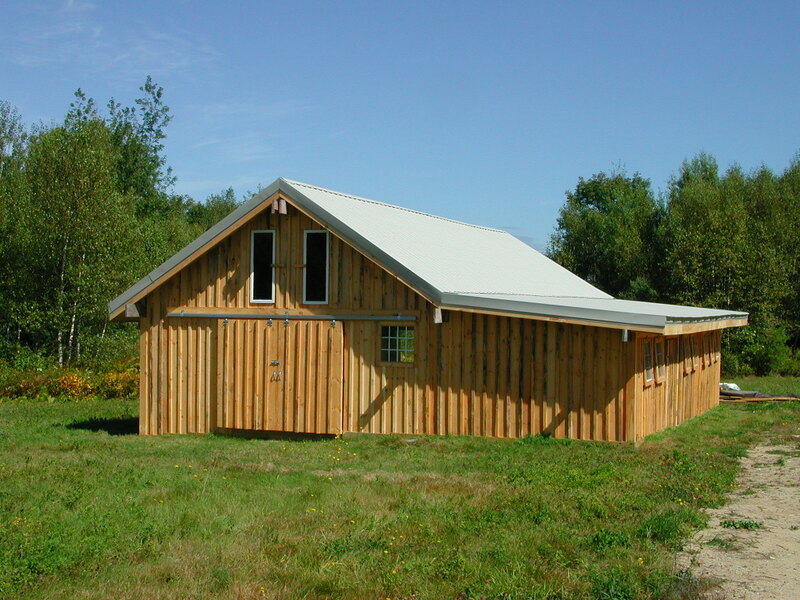 The pole barn. 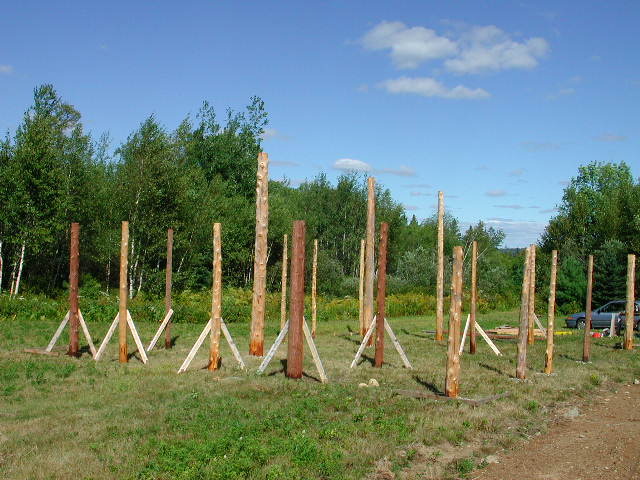 A 40 ft by 30 ft structure, supported by white cedar poles taken from our property. 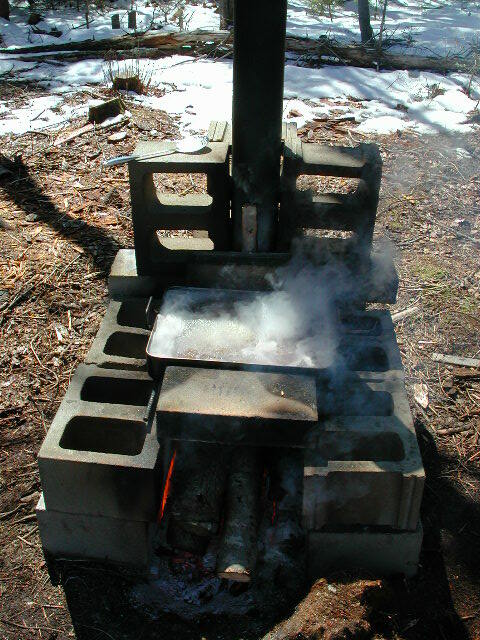 Maple sap boiling away on an outside open fire. 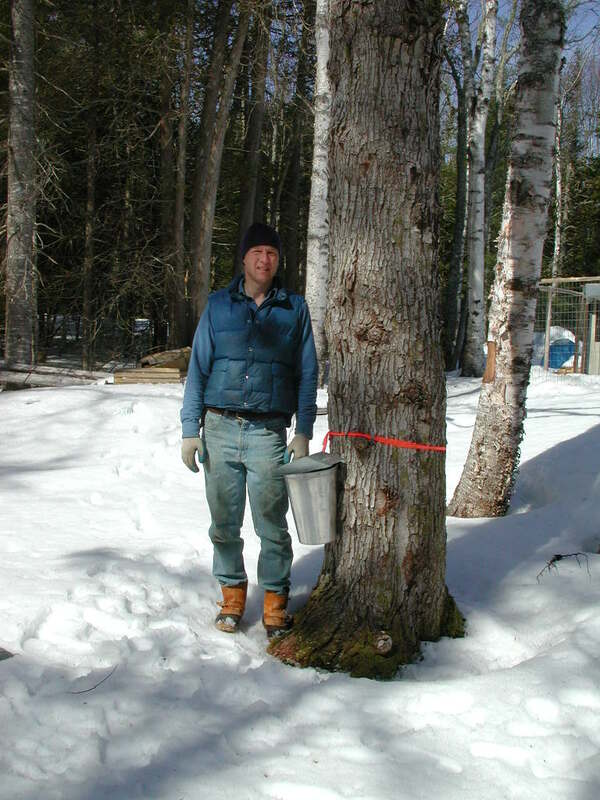 We produced 6 gallons of maple syrup our first year. 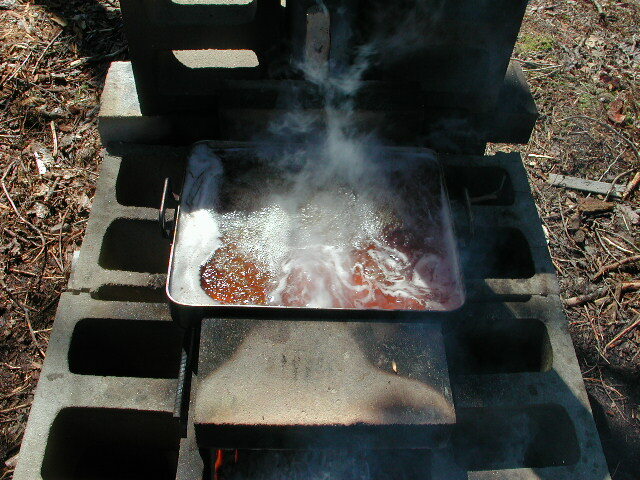 40 gallons of sap produced 1 gallon of syrup. 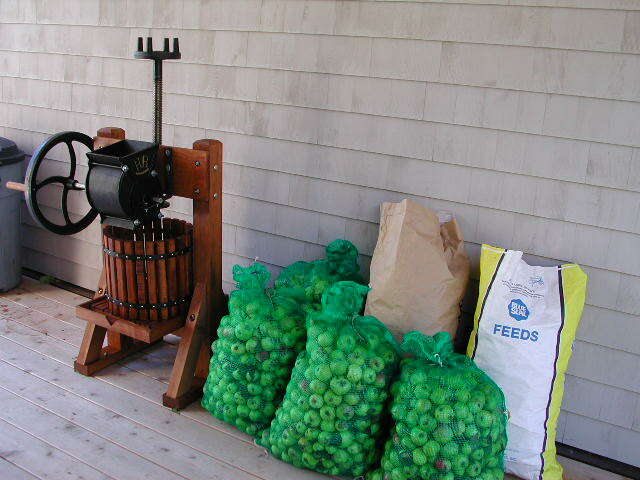 The apple press and some collected wild apples ready for pressing. 1 bushel of apples produced about 2 gallons of apple cider. 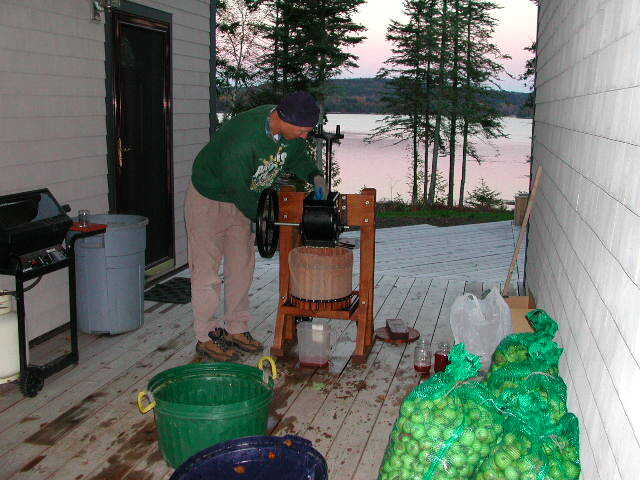 We pressed 17 gallons of apple cider the first year, 15 gallons the second. 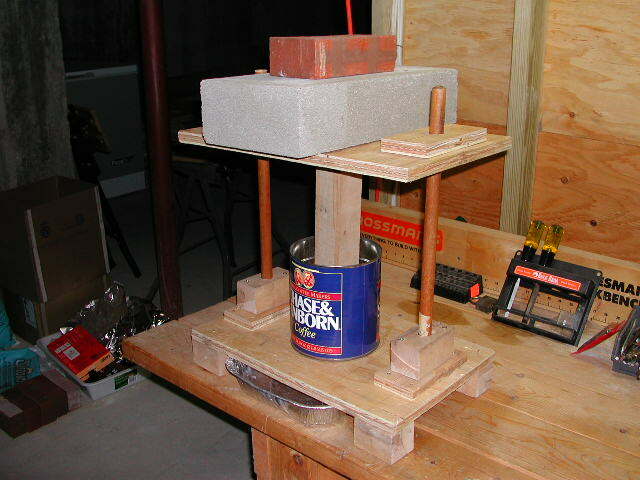 I experimented with making cheese over the winter using this home made cheese press.